Elliott Daingerfield; The Lone Cypress (detail); circa 1914; oil on canvas; Morris Museum of Art, Augusta, Georgia. Gift of the Robert Powell Coggins Art Trust. Influenced by the French Barbizon School, Tonalists, and Symbolists, the work of Elliott Daingerfield seeks to evoke the divine manifest in nature. Daingerfield’s work stands out among his National Academy of Design colleagues for its often distinctly southern mood. 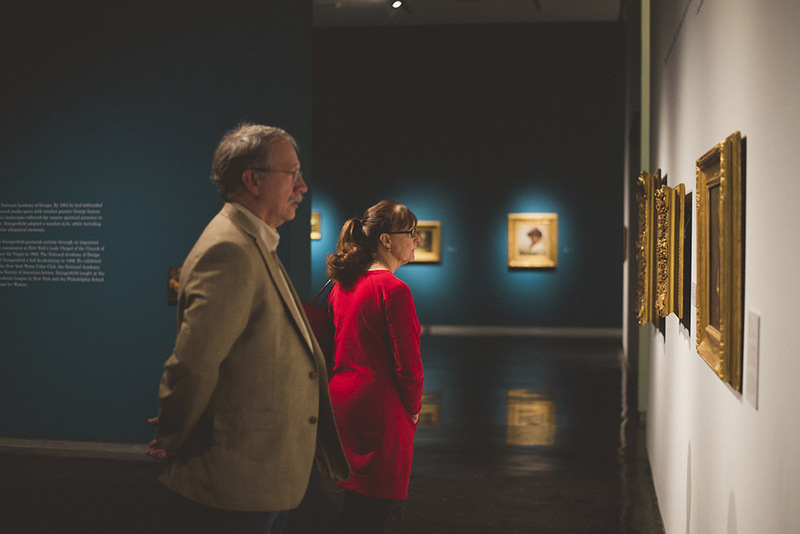 Everlasting Calm includes Daingerfield’s oil paintings of Southern scenes and monumental Western landscapes as well as studies for these works. Born in Harpers Ferry, Virginia in 1859, Daingerfield moved to New York to formally train in 1880. From 1886 to 1932, he maintained a studio in Blowing Rock, North Carolina and in New York, where he shared space with fellow Academy member George Inness. From his studios in New York and North Carolina, Daingerfield contributed to the growing internationalism of American Art as an artist, teacher, and writer. This retrospective exhibition is organized by the Morris Museum of Art, Augusta, Georgia. The exhibition will include over fifty works by Elliott Daingerfield as well as work by George Inness and Ralph Blakelock, contemporaries about whom Daingerfield published writings during the early 20th century. Everlasting Calm will be on view at the LSU Museum of Art through March 19, 2017. Generous support for this exhibition provided by the Imo Brown Memorial Fund in memory of Heidel Brown and Mary Ann Brown, Louisiana CAT, L. Cary Saurage II Foundation, Charles Schwing and Susanna McCarthy. Additional support provided by Taylor, Porter, Brooks, & Phillips, L.L.P. Practice plein air landscapes with instructor Tajreen Akter. Free admission all day, with fun activities geared for children of all ages in the Pennington Family Foundation Education Gallery. Attendees are welcome to bring their lunch to the third floor conference room to hear LSU MOA curator Courtney Taylor explain the tonalist style seen in Daingerfield's paintings. Practice figure drawing with a live model in the Everlasting Calm galleries with instructor Tajreen Akter. Baton Rouge’s Jim & James Linden Hogg will perform a selection of 19th century music in the fifth floor galleries. Practice still life drawing in the Everlasting Calm galleries with instructor Tajreen Akter. Opening reception: "Everlasting Calm: The Art of Elliott Daingerfield"
A public lecture from J. Richard Gruber, Ph.D., titled, "Elliott Daingerfield: Art + Life, 1859–1932," begins at 6 p.m. on the third floor, followed by a gallery tour on the fifth floor and light refreshments from 7 – 8:30 p.m. While giving tours of Everlasting Calm: The Art of Elliott Daingerfield, I’ve asked groups how many of them have heard of tonalism. To this question there is silence; arms remain dangling at our visitors’ sides. The Advocate's Robin Miller takes a tour through Everlasting Calm with Executive Director Daniel E. Stetson. Take a closer look at the space created in the Everlasting Calm exhibition. The Arts Council of Greater Baton Rouge's Mina Estrada discusses upcoming programs and exhibitions with curator Courtney Taylor. inRegister's Kelli Bozeman takes a look at the art of Elliott Daingerfield.